Students from Alex Munro’s Garden Club are now able to answer after their fabulous field trip to the Chinook Honey Company on May 11, 2016. 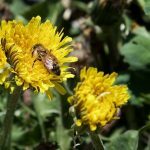 We started our visit with a picnic overlooking fields of dandelions and busy honeybees. Liam, our enthusiastic and engaging presenter, then talked to the children about bees, biology, hive structure and how they make honey from nectar and pollen with their bodies, aka bee spit! He also took apart a commercial hive so we could see the different structures and learn about their functions. 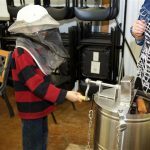 After Liam’s fact-filled presentation, the grade 3 to 6 students looked for the queen bee in a very active live display hive, constructed their own colourful honeycomb, tried on a beekeepers hat, and learned how honey is extracted from the comb. Also, much to everyone’s delight, we tasted different kinds of honey. The favourite was alfalfa, and dandelion was popular. However, the strong, dark buckwheat honey furrowed some brows. Thank you to Nature Calgary for a wonderful and impactful opportunity. The children and adults learned so much and had great fun. One grade 4 student was overheard proclaiming that this was the most fun he has had in school all year! Most importantly, the children are aware of the importance of pollinators in our urban habitats and are better prepared to create and protect healthy bee habitats.